Steierform includes lots of die cut shapes, technical labels as well as rolls of our comprehensive international adhesive tape programme. Our die cut products have the same balanced properties as the original adhesive tapes and additionally offer labour-saving cost reductions. To provide a clear view of this extensive programme Steierform has been divided into six product ranges, which complement each other and contribute to convenience and cost savings. 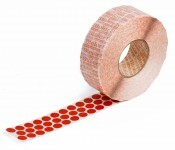 Steierform die cut dots, shapes and technical labels are supplied on rolls, unless otherweise stated. Our products are intended for adhesion to any dry, smooth surface, free of grease and dust.